Help Me Identify This Randall Cab? I found this cab in a local Craigslist post, but the seller neglected to include the model number. Until I hear back from him/her to check it out, I was wondering if any of you knowledgeable people might be able to help me. Some light Googling has got my hopes up that it's an RV412A (the "unique" Randall logo being the biggest indicator), in which case this would be a total steal! 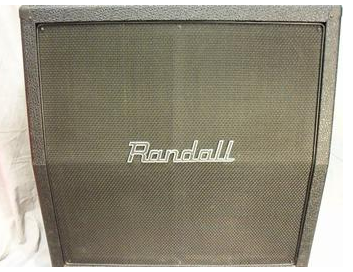 Not sure here, but the Randall badge does look like the badge on my RM100KH Kirk Hammett head, but his sig cabs should have a signature badge on the bottom right corner also i think. Maybe ask him/her to send you the type of speakers its holding? Could be the new RV series since that's looks like the newer hollowed out Randall logo.